While environmentalists continue to shout about the illegal fishing and fining of sharks, shark fin soup continues to grow in popularity. Shark finning is prohibited by many countries and has been banned by several ocean authorities, however many international waters are unregulated; making it incredibly difficult to regulate fishermen. A sure way to ensure that this inhumane practice stops, is to tell the truth behind the soup – after consumers know the facts about the dish, they’ll be less likely to purchase it. Decreasing the demand for shark fin soup is easier said than done however. Although it’s vital to limit the market to put fishermen out of work – encouraging them to fish conventionally – this dish is most popular in the Far East where fish is a main component of the diet. Shark has been on the menu for centuries and has become somewhat of a tradition to celebrate prosperity, marriages and business deals. The truth behind the soup is that shark fins are incredibly dangerous for human consumption. While they are believed to have many properties such as increasing your appetite or improving your kidneys, lungs and bones, the fact of the matter is that fins contain high levels of mercury which can cause sensory impairment, loss of coordination and disturbed sensation. Women and children have been advised not to eat shark fins at all costs. Environmentalists are calling all sea and nature lovers, shark cage diving companies and marine biologists to campaign against finning. They believe that explaining the process of finning will encourage consumers to rethink before purchasing the soup. 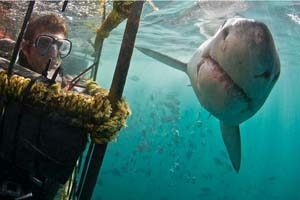 Fishing trawlers release nets into baited waters for sharks to swim into. Once the nets are full, they pull them back up onto the boats. The fishermen cut the sharks’ fins off before dumping them back into the ocean, where they have no means of swimming. The sharks die from suffocation or are eaten by other predators. For the environment, the decrease of sharks has truly crippling effects. In all oceans, sharks can be seen at the top of the food chain. Their loss will have a huge effect as their prey will become over populated. Sharks cannot be easily replaced in this web either. Taking between seven to twenty years to mature and with a gestation period between five months and two years depending on the species, there will always be a balanced prey-predator ratio. Shark fin soup may be a status symbol at Chinese social gatherings and is considered to be a delicacy, the reality is that promotes the inhumane fishing and finning of sharks, has hugely care-less implications for the environment and is incredibly dangerous for consumption. While fishermen have ways in which they get around regulations, it’s important to encourage consumers to refrain from purchasing shark meat or fins. In turn this will cripple these illegal fishermen financially and save our sharks. Sharks have been around for over 400 million years, if this continues however, they’ll become extinct within just a matter of decades.